"Bela can go anywhere, he can do anything," Abigail Washburn says. "He's a fearless explorer." From Louis and Keely to John and Yoko to Derek and Susan, married couples have worked together to give us some of the most interesting and powerful music of the past century. 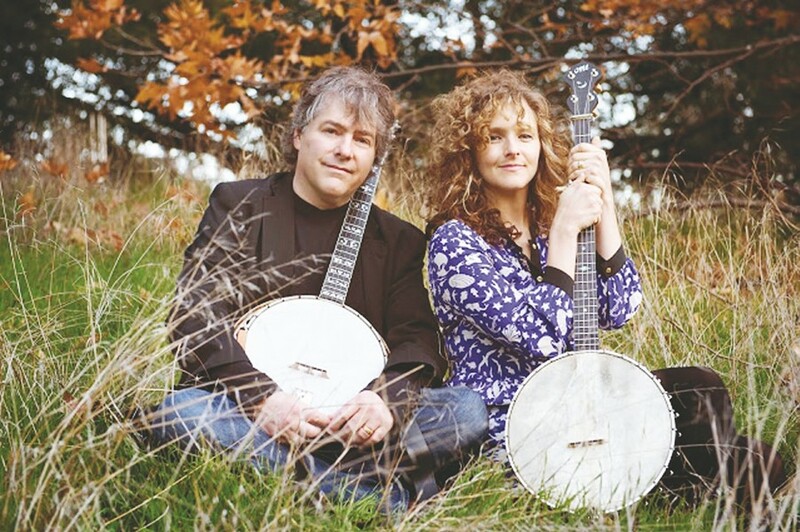 Enter Bela Fleck and Abigail Washburn, banjo innovators both, who wed in 2009 and are the proud parents of baby boy Juno, 10 months old. 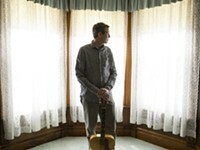 Fleck, whose musical skills and restless nature have taken him deep into the jazz, classical and blues realms, started as an fiery, innovative player in the progressive bluegrass band New Grass Revival in the early ‘80s. By the end of the decade, he and bassist Victor Wooten had kickstarted Bela Fleck & the Flecktones, and the banjo would never again be seen as something barefoot hillbilly boys plucked aimlessly on Appalachian front porches. Not that there’s anything wrong with that! 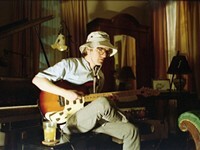 But Fleck, in the intervening years, has almost singe-handedly charted spectacular new territories for the instrument. Washburn was relatively new to the banjo when Fleck signed on to produce an album for her in 2005; she is a stunning vocalist and an ardent student of Chinese music and culture, all of which imbue her music with an otherworldly richness. 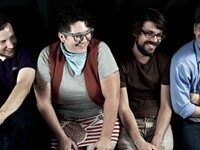 She and Fleck subsequently recorded and toured, with Casey Dreissen and Ben Solee, as the Sparrow Quartet. 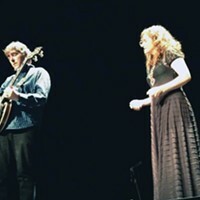 Both have played the Savannah Music Festival separately (in fact, the Sparrow Quartet stopped in once), but their March 30 lunchtime concert will mark the first time Mr. and Mrs. have done the Savannah deal as a twosome. CS: You're parents now. How's that working out? AW: It's amazing. We get to have a beautiful little creature that we get to take care of. It's incredible. BF: Abby is the Mother of the Year, as far as I can tell. And we've been taking him on the road, on these tours, and that's quite a challenge. But he's been great. And if we have an early show, he'll watch the whole show and even take part in it. The other night, Abby brought him out and she sang the encore holding him, and he pulled the cable out of the microphone and started sucking on it! The audience went wild. CS: Is this the first time you've toured together, as just the two of you? BF: We've been working into it. At first I think we did a benefit for Abby's grandma, at her church, and it went way better than we'd expected. We just threw a few things together and ended up being really happy with it. But we knew from then on that we would play as a duo, so it would pop up here and there. It's been on our radar as something we wanted to do some day together. We're now actually recording a record that'll be out in the Fall. AW: This is the first time we've taken it seriously ... well, we've loved to play music together from the beginning, so that's an obvious connection. CS: Abby, the last time we spoke, you were telling me that you'd picked up banjo a lot later, and that you were a little intimidated at first playing with the old master. Have you gotten over that— 'oh, it's just Bela'? AW: On one level, it's a part of our routine. But on another level, the things that come out of him musically night after night are always astonishing. That wouldn't happen in any other situation, and I see it and I recognize it. And it's always inspiring. BF: I think that everybody has different things that they bring to it. I play with a lot of different musicians, and some of them have abilities that I don't have. And when I play with them I have to deal with that kind of a thing. For instance, if I go out and play with Chick Corea, as a duet, he’s got abilities that I don’t have. But we meet in the areas where we can meet. And he does his thing, and I do my thing, and we have a great time. And I think it’s that way with Abby. She has abilities that I don’t have. Even playing abilities—I’ve never been much of a clawhammer player, and she can lay down a groove that I can do almost anything over. And also, her vocals are just so compelling. So I get to be part of music that reaches out to people, and connects with people in a whole different way than the instrumental music that I tend to get involved with. So for me, it’s just a wonderful experience. It’s not like we’re unequal—it’s more like we’re finding different ways to interface. CS: Does the other person's creativity change you, depending on the person? BF: Exactly. That's the compelling thing for me about playing with a lot of people, because I get to be different. I'm not the same old me. When I play with Abby, I play different. And I play different with her than I play with, for instance, Sam Bush and Jerry Douglas. Or Tony Rice. There are elements to our duo that is traditional, our Abby and Bela duo, I get to play in a more traditional fashion than I do playing with Chick Corea, or the Flecktones and so forth. But with Abby, it's even a different subset because she has this old-time element. And also the beautiful aspects. As an improvising artist, which is a big part of what I try to be, I’m improvising a lot with Abby but I’m responding every day to what it feels like will work well. But yeah, I definitely spark to whatever’s going on around me. CS: Abby, are you still bringing the Asian influences into your music? 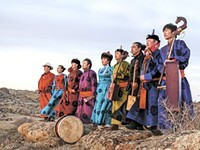 AW: Yeah, in fact Bela and I decided to seek out a new traditional Chinese song, from southeast China, to try and go in a new direction with some of the Chinese repertoire. And it's exciting; Bela can go anywhere, he can do anything. He's a fearless explorer. Which is so exciting for me, because I'm game for the journey, but I might not even seek out certain directions that he sees. BF: We were listening to a lot of difference Chinese stuff and I was like "Abby, we should do one of these even more obscure, totally Chinese things." The two that we did with the Sparrow Quartet are almost like pop, not pop but like folk songs—they're very, very well-known simple songs. And this shows her voice off in a completely different way that any of the Chinese-type stuff I've heard her sing before. I like that because it's showing a new corner of what she's able to do. AW: Which is a big part of what Bela brings to me musically, new challenges, new ideas. Sometimes it's scary and frustrating, and sometimes it's pretty exhilarating. So I grow a lot when I play with Bela. CS: Tell me about the record you're making. AW: Old murder ballads, old Carter Family songs and things like that. BF: So that accounted for six or seven tunes. Once we got into old tunes of Abby's that she'd never recorded that we had nice duet versions of. So hey, let's put that on the table. So basically what we're doing is recording a pile of stuff. We'll probably record 16 or 17 songs, and then see what the record is. In there. And this week we're going to complete three new tunes we've been working on. There's an instrumental that we've written together, and a really cool song that Abby wrote. CS: Bela, is this like going back for you, to Newgrass Revival days, isn't it? There's a lot of Americana in this now. Is there an element of "I used to play this stuff a lot"? BF: Yeah, it's the stuff that made me want to play in the first place. And that I love, but I petered out of because I was so interested in moving forward I moved out of that world. Not because I didn't love it, but just because there were new challenges. And so now, I'm coming back to it in a very earthy, natural way—playing with the two banjos. The nice thing for me is that, on top of that rippling I’m hearing some beautiful singing. And I don’t to hear that normally. Abby can access a really old sound with her voice, and an old feeling. Ricky Skaggs calls it the Ancient Tones. And I’ve heard Abby get those sounds. And I love it when I hear it.